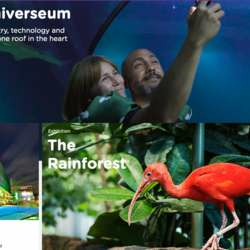 "Animals, nature, chemistry, technology and fun experiments under one roof in the heart of Gothenburg"
It will take Protected content exploring all the exhibitions. Accordingly, they have the second largest acquarium in Europe. That alone is worth seeing, but wait they have rainforest and it is amazing to be able to walk with those monkeys, birds and other animals again. And the coolest part is, it is not just two awesome exhibitions but 6! Note: We are allowed to take close up pictures, but no petting and feeding the animals. And also the flash of the camera must be off. You can buy at the ticket counter or online. Arrive 15min early so we still have time for a little introduction before we go exploring. I'm using my Finnish number but you can reach me through WhatsApp.